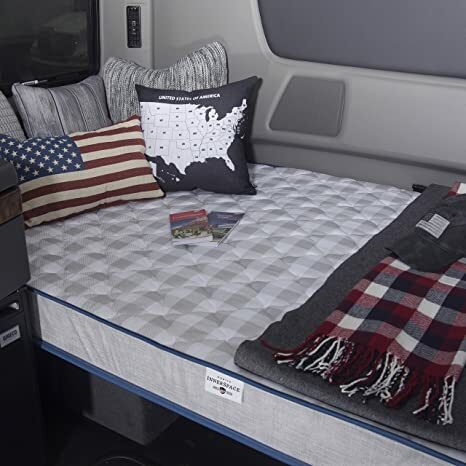 Bring the comfort of home on the road with the American-made quality of a Truck Relax Reversible Mattress by Mobile InnerSpace. Each mattress is skillfully assembled by hand in the USA and compression roll packed, making it easy to carry into your truck. Our innovative mattress-in-a-box packaging allows for effortless installation in under a minute, so you can simply open the box, unwrap, expand and go. Once installed, the newly redesigned mattress creates an inviting truck cab with its cozy gray check pattern and blue trim, while the durable 5.5-inch firm support comfort core and one-sided quilting ensure a full nights sleep. We care about the sleep health of professional truck drivers on over-the-road-trips and offer a 30-Day Sleep Test Guarantee. Be rested for the road ahead. 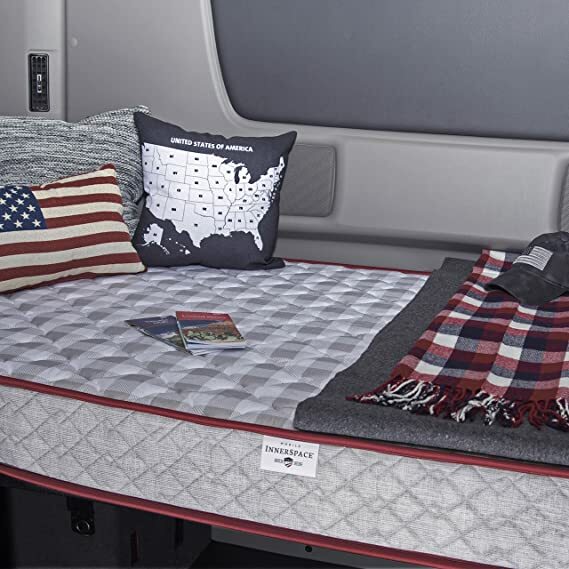 Bring the comfort of home on the road with the American-made quality of a Truck Luxury Reversible Mattress by Mobile InnerSpace. Each mattress is skillfully assembled by hand in the USA and compression roll packed, making it easy to carry into your truck. Our innovative mattress-in-a-box packaging allows for effortless installation in under a minute, so you can simply open the box, unwrap, expand and go. 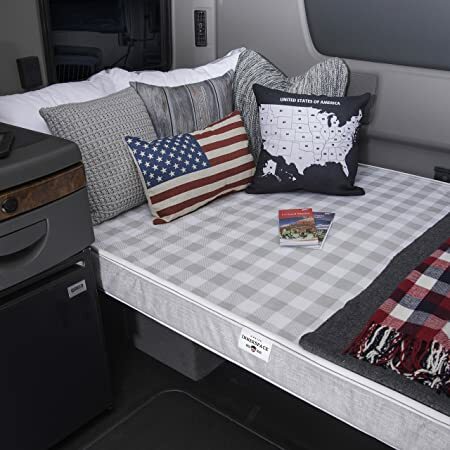 Once installed, the newly redesigned mattress creates an inviting truck cab with its cozy gray check pattern and red trim, while the durable 6.5-inch firm support comfort core and double-sided quilting ensure a full nights sleep. We care about the sleep health of professional truck drivers on over-the-road-trips and offer a 30-Day Sleep Test Guarantee. Be rested for the road ahead. Bring the comfort of home on the road with the American-made quality of a Truck Sleep Reversible Mattress by Mobile InnerSpace. Each mattress is skillfully assembled by hand in the USA and compression roll packed, making it easy to carry into your truck. Our innovative mattress-in-a-box packaging allows for effortless installation in under a minute, so you can simply open the box, unwrap, expand and go. Once installed, the newly redesigned mattress creates an inviting truck cab with its cozy gray check pattern and white trim, while the durable 4-inch firm support comfort core ensure a full nights sleep. We care about the sleep health of professional truck drivers on over-the-road-trips and offer a 30-Day Sleep Test Guarantee. Be rested for the road ahead. Bring the comfort of home on the road with the American-made quality of a Truck Relax Firm Support Mattress by Mobile InnerSpace. Each mattress is skillfully assembled by hand in the USA and compression roll packed, making it easy to carry into your truck. Our innovative mattress-in-a-box packaging allows for effortless installation in under a minute, so you can simply open the box, unwrap, expand and go. Once installed, the newly redesigned mattress creates an inviting truck cab with its cozy gray check pattern and blue trim, while the durable 5.5-inch firm support comfort core and one-sided quilting ensure a full nights sleep. We care about the sleep health of professional truck drivers on over-the-road-trips and offer a 30-Day Sleep Test Guarantee. Be rested for the road ahead. Bring the comfort of home on the road with the American-made quality of a Truck Relax Firm Support Mattress by Mobile Inner Space. Each mattress is skillfully assembled by hand in the USA and compression roll packed, making it easy to carry into your truck. Our innovative mattress-in-a-box packaging allows for effortless installation in under a minute, so you can simply open the box, unwrap, expand and go. Once installed, the newly redesigned mattress creates an inviting truck cab with its cozy gray check pattern and blue trim, while the durable 5.5-inch firm support comfort core and one-sided quilting ensure a full nights sleep. We care about the sleep health of professional truck drivers on over-the-road-trips and offer a 30-Day Sleep Test Guarantee. Be rested for the road ahead. AMZ-TK-4280 Mobile Innerspace Truck Luxury Mattress, 42 by 80 by 6.5"
AMZ-TK-3579 Mobile Innerspace Truck Luxury Mattress, 35 by 79 by 6.5"
AMZ-TK-3676 Mobile Innerspace Truck Luxury Mattress, 36 by 76 by 6.5"